Click the Smashwords link under the bookcover on the right. Use Coupon code QH63K. Enjoy! A Good Review! From Jessica, a winner of my Goodreads Giveaway. I loved this book. Ms. Munroe did an excellent job creating characters that were engaging and easy for the reader to love/hate. Yes, their experiences center around a darker subject (domestic violence and sexual addiction) but it was refreshing to see. She was not afraid to shy away from the harder subjects that people would like to forget about. I felt so much empathy for Lily as she dealt with the demons caused by her previous life. As a former victim of domestic violence, there were many times that I could remember that part of my life where it seemed like everything caused a flashback. This is an excellent testament of hope for people who have been her place to show, regardless of the situation, it can get better and be better. There are Christian undertones and excerpts throughout the story but not excessively and always used to highlight Lily's journey from where she was to where she ended up. Overall, an excellent read for anyone who's not afraid to recognize that all storys, people, characters and lives are not sunshine and roses. Thank you, Jessica! My writer's heart is doing a happy dance! I published Another Place on the Planet on Tuesday of this week on Smashwords and Thursday on Kindle! I actually did it! Today my best friend, well, one of a few best friends back in PA sent me roses to celebrate. She must have read somewhere that the main character is named Lily and She receives orange roses from Charlie. “Really?” I reread the card. “Orange says it all” I read aloud. I blushed, giggled and felt my heart skip a few beats in a kind of happy dance. Come to find out, she didn't read about orange roses in the book and know the main character's name is Lily. She said she liked how the arrangement looked on the web and wondered if I like orange. Then she said God knew. 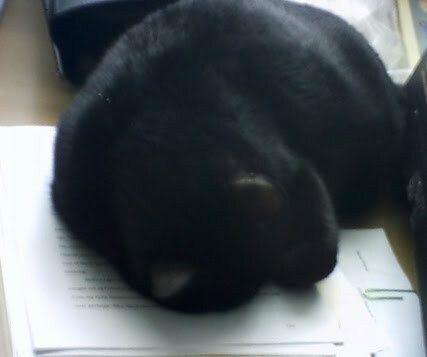 This is my writing cat, Twitch. Here, he found a cozy warm place to snooze atop an old copy of a manuscript. When he's not sleeping on our bed, or grazing in his food dish, he's keeping me company in my office.